On a chilly December afternoon in 1975, Bernard Whitehurst Jr., a 33-year-old father of four, was mistaken for a robbery suspect by Montgomery, Alabama, police officers. A brief foot chase ensued, and it ended with one of the pursuing officers shooting and killing Whitehurst in the backyard of an abandoned house. The officer claimed the fleeing man had fired at him; police produced a gun they said had been found near the body. In the months that followed, new information showed that Whitehurst, who was black, was not only the wrong man but had been unarmed, a direct contradiction of the white officer's statement. What became known as the Whitehurst Case erupted when the local district attorney and the family's attorney each began to uncover facts that pointed to wrongdoing by the police, igniting a year-long controversy that resulted in the resignation or firing of police officers, the police chief, and the city's popular New South mayor. However, no one was ever convicted in Whitehurst's death, and his family's civil lawsuit against the City of Montgomery failed. Now, more than four decades later, Whitehurst's widow and children are waging a 21st-century effort to gain justice for the husband and father they lost. The question that remains is: who decides what justice looks like? In this latter-day exploration of the Whitehurst Case, author Foster Dickson reviews one of Montgomery's never-before-told stories, one which is riddled with incompatible narratives. 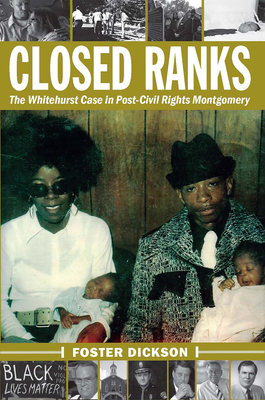 Closed Ranks brings together interviews, police reports, news stories, and other records to carry the reader through the fraught post-civil rights movement period when the "unnecessary" shooting of Bernard Whitehurst Jr. occurred. In our current time, as police shootings regularly dominate news cycles, this book shows how essential it is to find and face the truth in such deeply troubling matters.